In 1868, W.E.B. Du Bois (William Edward Burghardt Du Bois, pronounced 'doo-boyz') was born in Massachusetts. He attended Fisk College in Nashville, then earned his BA in 1890 and his MS in 1891 from Harvard. Du Bois studied at the University of Berlin, then earned his doctorate in history from Harvard in 1894. He taught economics and history at Atlanta University from 1897-1910. The Souls of Black Folk (1903) made his name, in which he urged black Americans to stand up for their educational and economic rights. 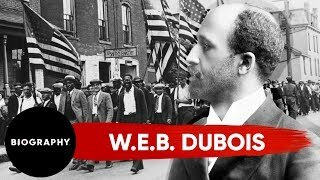 Du Bois was a founder of the National Association for the Advancement of Colored People, and edited the NAACP's official journal, "Crisis," from 1910 to 1934. Du Bois turned "Crisis" into the foremost black literary journal. The blac In 1868, W.E.B. Du Bois (William Edward Burghardt Du Bois, pronounced 'doo-boyz') was born in Massachusetts. He attended Fisk College in Nashville, then earned his BA in 1890 and his MS in 1891 from Harvard. Du Bois studied at the University of Berlin, then earned his doctorate in history from Harvard in 1894. He taught economics and history at Atlanta University from 1897-1910. The Souls of Black Folk (1903) made his name, in which he urged black Americans to stand up for their educational and economic rights. 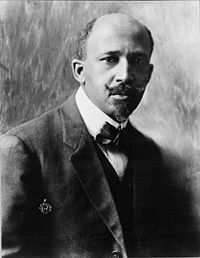 Du Bois was a founder of the National Association for the Advancement of Colored People, and edited the NAACP's official journal, "Crisis," from 1910 to 1934. Du Bois turned "Crisis" into the foremost black literary journal. The black nationalist expanded his interests to global concerns, and is called the "father of Pan-Africanism" for organizing international black congresses. Although he used some religious metaphor and expressions in some of his books and writings, Du Bois called himself a freethinker. In "On Christianity," a posthumously published essay, Du Bois critiqued the black church: "The theology of the average colored church is basing itself far too much upon 'Hell and Damnation'—upon an attempt to scare people into being decent and threatening them with the terrors of death and punishment. We are still trained to believe a good deal that is simply childish in theology. The outward and visible punishment of every wrong deed that men do, the repeated declaration that anything can be gotten by anyone at any time by prayer." Du Bois became a member of the Communist Party and officially repudiated his U.S. citizenship at the end of his life, dying in his adopted country of Ghana. D. 1963.